I have a small document where I used a certain font - Aileron - in many places but decided it didn't look as good as I had originally hoped. I went through the document changing it where necessary, then I went into the Font Manager to see if I had done all the changes I needed to. However, when I choose the font I want to locate and press the "Locate" button, no layers or text gets selected. Nothing at all happens as far as I can see. I'm fairly sure that I've made all the changes - I've even checked all the text styles (I think), including the TOC ones - but it seems that the Font Manager thinks the old font is still in there somewhere. The same font is also listed in the "Used" tab of the font selector. I didn't want to put this down as a bug until I thought I had exhausted my options. You can Find text by its properties (such as font). 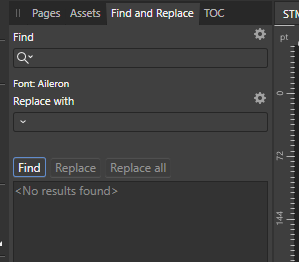 In the Find and Replace panel leave the search box blank, but click the cog And you'll be able to search for the format characteristics you want to look for. You could even have made the change globally using this panel, by specifying the new font in the Replace options (if that is working in the current beta; I haven't tried it recently). Nice tip for Find and Replace, I didn't even realise that it was there so I should definitely look into that further. I wonder how many other people don't know that it's there 'hiding' in the Studio sub-menu. I've just tried searching for the font but get <No results found>. So it seems that both Find and the Font Manager agree it's not used anywhere. But it seems odd that the Font Manager still lists it. That doesn't work here. No matter how I set the format selection I couldn't find anything if I listed font in format. I had two fonts used and couldn't find anything using either font. Note: Choosing menu "Text -> Find" seems to bring up the same panel as menu "View -> Studio -> Find and Replace". I tried to search by using various format options - including formats that I know are used in the document - and got nothing back in the results. However, I notice that the Help states that "You can further refine your search or replacement behaviour by selecting additional options" (my emphasis) - including "Format", which tells me, if I have interpreted it correctly, that the Format settings might only apply to the Find function if you have already supplied some text to search for. This seems quite reasonable but it doesn't help with this issue. P.S. It might be useful if the results box showed something like <You must supply some text to search for> rather than <No results found> when search text has not been given. This would make it easier to see what's going on as <No results found> sounds like a search has been made even when no text has been searched for. I wondered at first whether there might be a space formatted to that font somewhere in there. Another thought is that sometimes a program can remember one's intention to use a font. For example if one types some text and formats it to a font and then later one deletes the text, in some programs sometimes the intention to use that font can be remembered in case one starts typing at that place again. Could it be something like that happening? However﻿, I notice that the Help states that "You can further refine your﻿ search or replacement behaviour by selecting additional ﻿options" (my emphasis) - including "Format", which tells me, if I have interpreted it correctly, that the Format settings might only apply﻿ to the Find function if you have already supplied some text to ﻿search for. This seems quite reasonable but it doesn't help with this ﻿issue﻿. Interesting point. I know that searching just for a property used to work, but maybe it's changing or changed. However, to see if that's the issue, you might do a regular expression search for . or . * with a font specified. I've just done a search for (without the quotes) ". ", ". *", "? ", ".?" with the specified font and got nothing either with a "Normal" search or a "Regular Expression" search. I don't use regular expressions much myself so I'm no expert and there's nothing I can find in the Help to tell me about how to use them. William: You could be right about Publisher remembering I was using the font - for some reason - but I don't know how to see where it thinks I might still be using it. Begin reading the post linked to in the below thread for more pertinent options. I found the same page myself, and it looks interesting. A post that I found by Patrick Connor said that Publisher was using "perl type (or ‘ECMAScript with perl extensions’) regular expressions", but I don't know if they are the same as what is discussed on the page we both found. He also said the search "will be performed using the "C" or "POSIX" locale" but I have no idea what that means. This issue isn't a massive problem for me with this document as it's only a basic newsletter, but I imagine it could be a major headache for someone with a large and complicated publication. I can just ignore it - if the odd letter isn't in the right font (the replacement is quite similar) then I don't really care - but they might not be able to do that. Mike: Thanks for posting a link to that site. That looks like it will be very useful. Bookmarked for future reference. ...Mike: Thanks for posting a link to that site. That looks like it will be very useful. Bookmarked for future reference. As I mentioned in some other thread, GREP can be a rabbit hole of time wasting. I do think that if one is going to be using GREP much, it does pay off in figuring things out, both by research and with help from others here on the forum. But if one isn't going to use GREP much, it would be faster to just ask on the forum. Also, if one desires, there is a great book that is specifically for InDesign by one of our forum members, @Peter Kahrel that I think would be useful for everything GREP related that is not ID specific. In general, though, one can find many answers on the web. GREP is widely used. There is also a specific GREP Facebook group that might be useful (Treasures of GREP). One does need to join it. GREP does look like something that would be very useful but only, as you say, if I can put the time into learning it properly. Hopefully its inclusion in Publisher will help a lot of people and maybe, one day, I'll be one of them. Having had a chance to experiment with this, specifying a font as a Find option is completely broken at least on Windows with Publisher .249. If you specify a font then you can't find anything, whether you use a normal search or a regular expression search. Thanks for logging that Walt. I see from the reply that it's a known issue so we can wait and see what happens.